Our Organic Potting Mix lets you grow potted plants the all-natural way AND get amazing results. In fact, it works so well there's a chance you'll get totally carried away planting and run out of pots. We start with our Living Earth Organic Compost - the magic, nutrient-rich ingredient in all our mixes. Then we sprinkle in some Bark Fines to give it a bit of body. Pumice (aiding drainage) is added next. And last, but not least we throw in some Organic Fertilisers for all-natural growing performance. 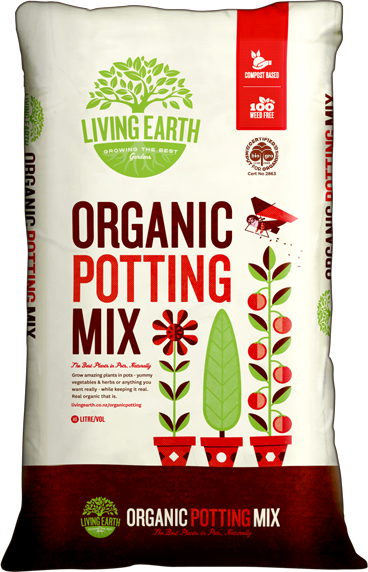 Fill up pots with Living Earth Organic Potting Mix leaving a gap of 2-3cm from the rim. Plant directly into the potting mix and water thoroughly. 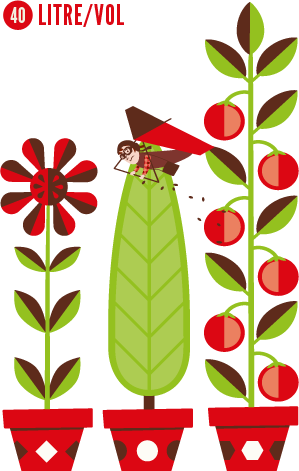 Feed with Living Earth Organic Liquid Compost every fortnight. (Or if you can't remember do it every fortnight, do it every two weeks instead). Replenish or top up with more Organic Potting Mix after each spring or when you re-plant.